Along with the Library’s new Director of Development, Christina Dreher, came the idea to both support health literacy in the community and raise money for the Library at the same time. 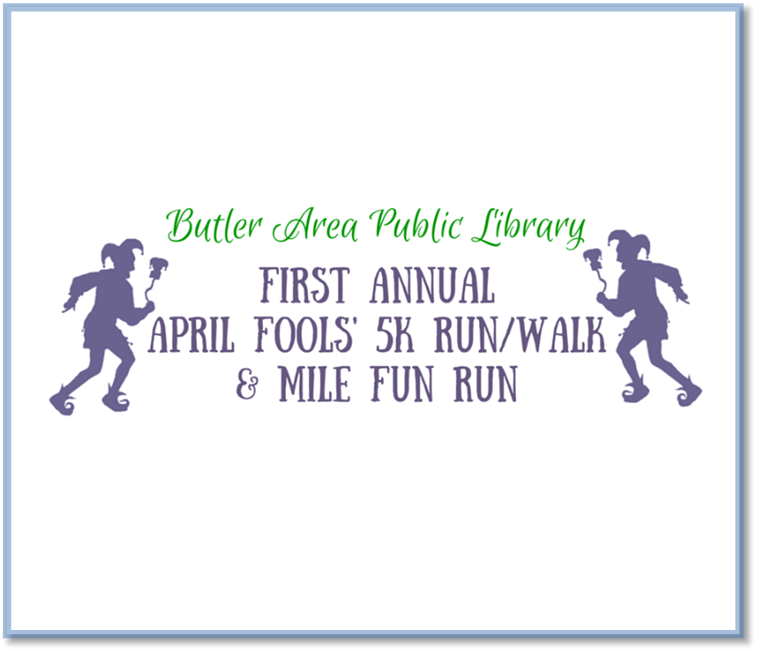 On Saturday, April 2, 2016, the Butler Area Public Library will host its First Annual April Fools’ 5K Run/Walk & 1 Mile Fun Run. The race will take place at the local Alameda Park and start at 9:00 a.m. Following the race will be a reception featuring sponsors, raffles, food & drink, and more. 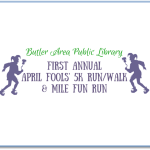 You can register today on Active.com or Butlerlibrary.info. Libraries genuinely care about the wellbeing of their communities. The Butler Library hopes to connect even more people to library services and to encourage the development of healthy minds and healthy bodies. The April Fools’ Race is more than just a one day event. 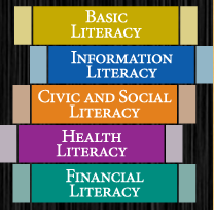 It is an avenue for other health literacy and awareness services the Library provides for people. Book displays throughout the Library feature running, exercise, healthy eating, meditation, health for seniors, and inspiring stories by well-known athletes. One librarian is even hosting a Couch to 5K training group for beginners looking to start running. Even after the race, she will start the program over again as a part of this year’s summer reading program and as a continued effort to help others lead healthier lives.